Bottom Line: Texas SuperFood has a lot of good ingredients. But, it doesn’t necessarily deliver on all its claims. It may be a good way to close some nutritional gaps, but it is not a replacement for a balanced diet. 2. History of the Brand: How Did Texas SuperFood Start? 6. Who’s Texas SuperFood For? 7. How Does Texas SuperFood Work? 8. Does Texas SuperFood Work? 13. Any Texas SuperFood Lawsuits? 16. Would Texas SuperFood Work with Your Diet? 17. Verdict: Would I Recommend Texas SuperFood? Bottom Line: Texas SuperFood has a lot of good ingredients. But, it doesn't necessarily deliver on all its claims. It may be a good way to close some nutritional gaps, but it is not a replacement for a balanced diet. May not have the bioavailability people need to get the most from it. Texas SuperFood is a nutritional supplement that claims to help you close the nutritional gaps between what you should eat and what you actually do eat. It claims to give you micronutrients, vitamins, enzymes, and probiotics, all from raw fruits and vegetables. It sounds great, but if it were that easy, we’d all be healthy thanks to a pill. What they fail to mention is your body can’t necessarily absorb the nutrients from the pill as well as it would from the whole foods. I wanted to give it a try because let’s face it, we all know we can make improvements in the way we eat. My review is a combination of my experience, as well as the research I was able to find about the company and what other people who used Texas SuperFood experienced. Texas Superfood contains premium nutritional ingredients delivered in a capsule form. If you’d like to try it for yourself, Texas SuperFood can be purchased through Amazon or using their Official Site. Texas SuperFood is one of three health supplements made with raw fruits, vegetables, and enzymes aimed at increasing your overall health. There are three supplements each with varying ingredients and price points. Some of them are available in capsules and powder, so you can choose the method that works best for you. 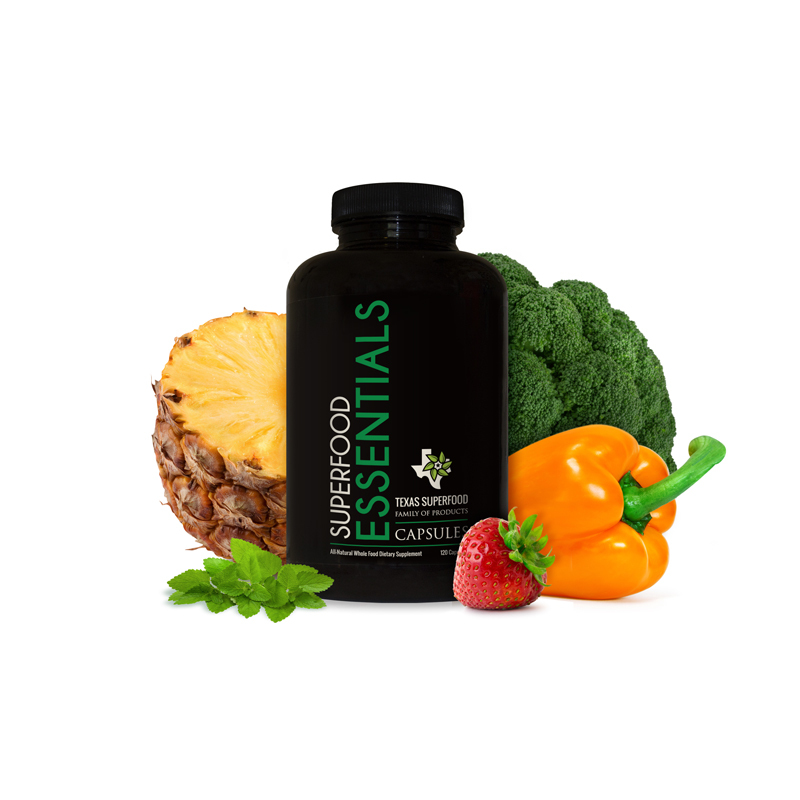 This review focuses on the Original SuperFood formula, which is the middle-ground in terms of both price and ingredients. Texas SuperFood is a product of The Nuplexa Group, Inc. The company is based in Carrollton, Texas. Public records show the company became official on Monday, November 17, 2014, making the company almost four years old at the time of this review. There is little information about who founded the company, and the background they have to make us trust the brand. Texas SuperFood products include three fruit and vegetable supplements, a line of nutritional supplements, and colloidal silver. Though I wasn’t able to find out exactly where it is manufactured, the official website notes that their products are made in GMP certified manufacturing facilities in the USA. And they note the fruits and vegetables are not cooked during processing, which means their nutrients are fresh and not destroyed in the manufacturing process. According to the company, it’s for everyone from children to seniors who want to live a healthy life. They offer products for all ages and medical concerns. Texas SuperFood works by providing nutrition from fruits and vegetables to your body. Texas SuperFood contains: Organic Fruits and Vegetables, Digestive Enzymes, Beneficial Probiotics, Select Premium Herbs. There are mixed reviews. Many people said it did nothing for them but cause side effects, while others say it worked wonders for their energy levels. I’m not sure my experience qualifies as working – I didn’t notice much of a difference, but I did feel a little better. I’m not sure that could be attributed to the supplement, though. And of course, the results you get depend on the other parts of your diet and routine. I slept better and noticed my skin looked better, but there’s nothing definitive that proves to me it’s because of Texas SuperFood. It could be that I had a better routine in general. Since the majority of the products are capsule-based, you don’t have to worry about the taste. The powders aren’t exactly the greatest tasting thing on earth, but you can mitigate that by experimenting with what you mix it with. There are no official Texas SuperFood product warnings. However, there are ingredients that may not be safe for women who are pregnant or nursing or those who are on prescription medication to treat certain medical conditions. This depends on the formula you choose. There are also ingredients that could cause issues for some with food allergies, such as onion and strawberry. That’s why it’s always a good idea to speak with your doctor before you start to use this or any other supplement. Texas SuperFood would work with any diet because it is vegan, dairy-free, soy-free, gluten-free, and free of artificial sweeteners. I don’t really think the product is worth the price they’re asking for it. While it’s good to get as much nutrition as you can and we can all agree most diets need a little help, I am a much bigger fan of getting my nutrition from whole foods than supplements. If I use supplements, I want them to be geared at weight loss, not overall nutrition. That said, if you’d still like to try their products, there are several promotional codes, like this one for 30 percent off, out there so you can try for yourself. Texas SuperFood can be purchased through Amazon or using their Official Site.